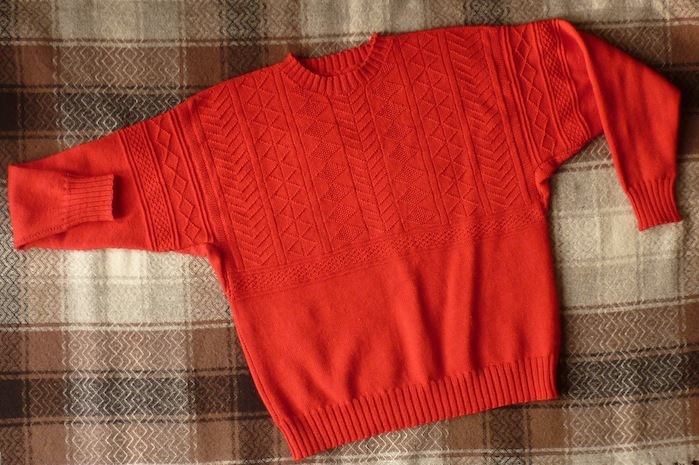 It has taken me over a year to complete, but I am now the proud owner of a traditional Cornish Knit-Frock. Mary Wright’s book is full of interesting facts and history of the traditional frocks and guernseys and good instructions on how to knit one yourself. I would encourage you to read it. 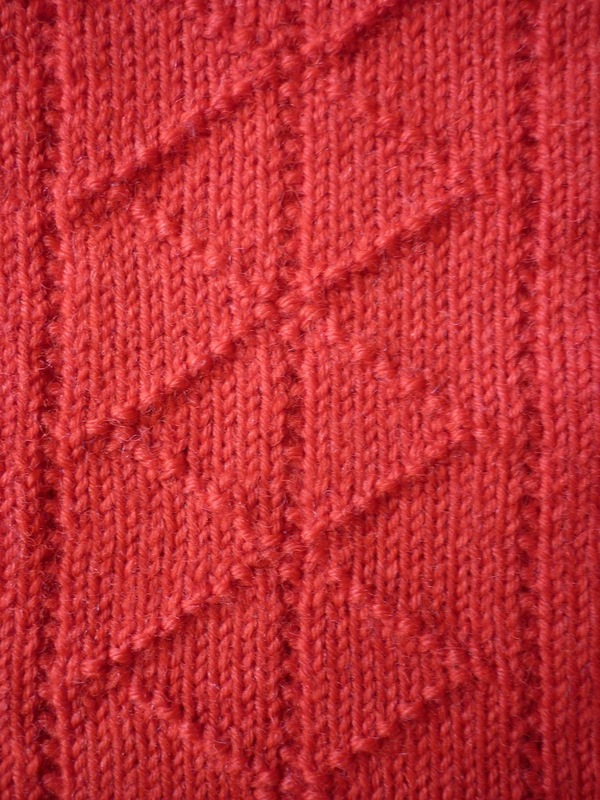 The shape of a knit-frock (this appears to be the Cornish name for a guernsey or gansey), is very simple, which makes for easy knitting, but it also does not distract from the beautiful patterning. The bottom half of the jumper was frequently tucked into (high-waisted) trousers, so they usually have no patterns: it’s less bulky. 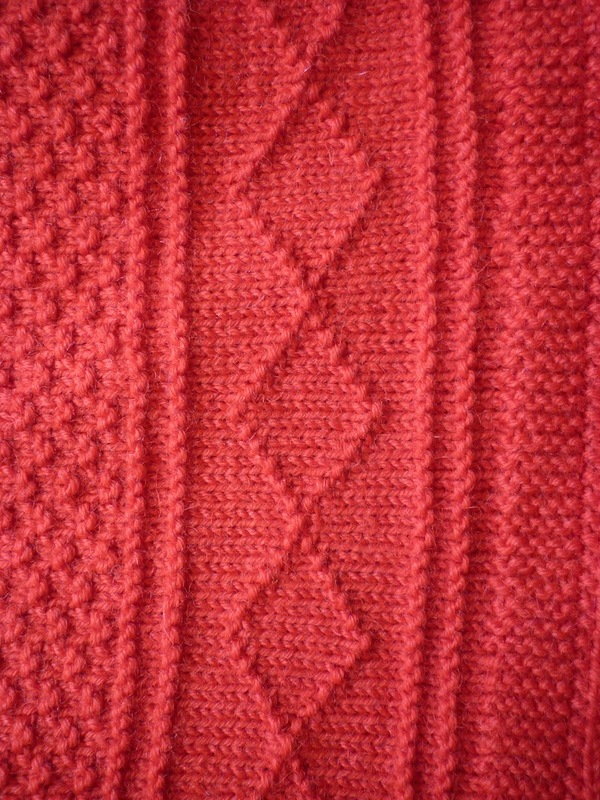 The exposed part of the sweater is textured for extra warmth. 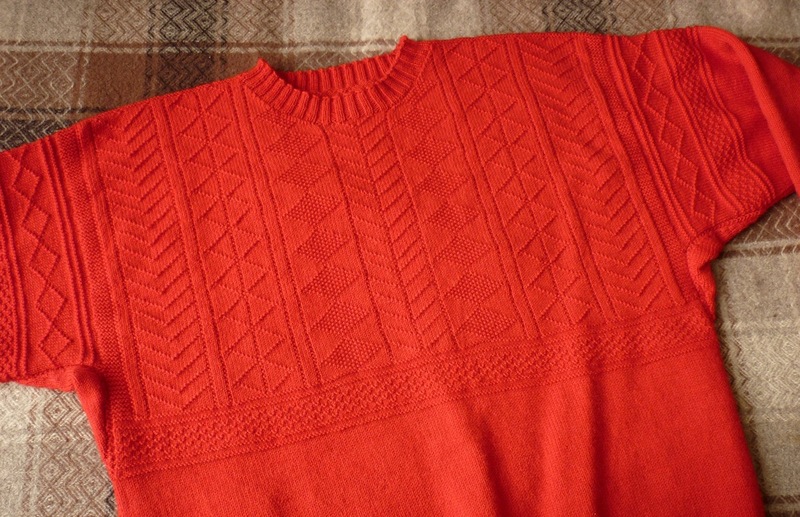 During the eighteenth and nineteenth century, many women knitted these jumpers inbetween their daily tasks to earn money, while their husbands were away at sea. To make this worthwhile speed was essential. 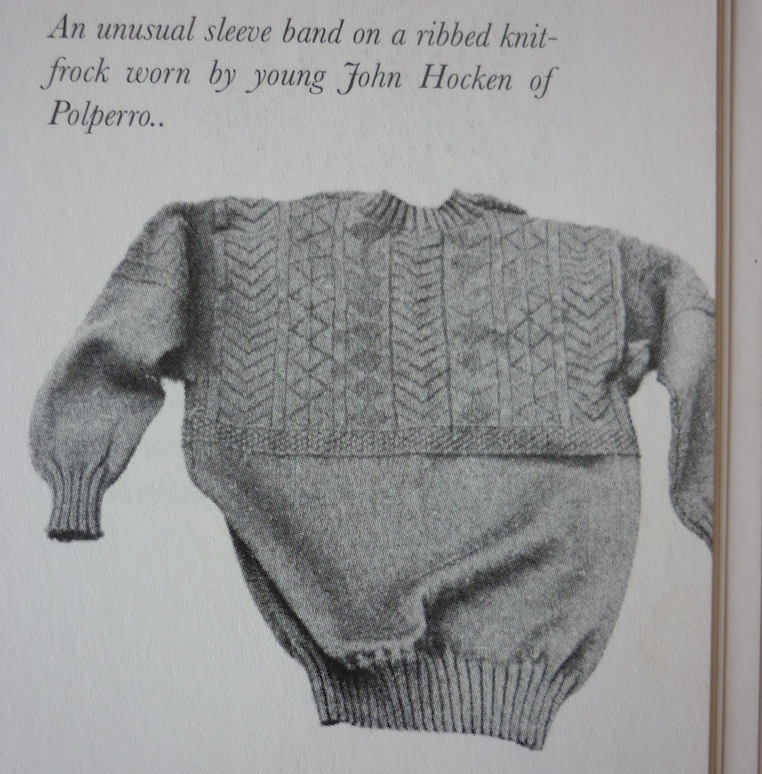 Several things aided in making the knitting quicker: the jumper was mainly constructed in the round and knitted on very long double-pointed needles. They often used a knitting stick, which could be tucked into a waistband. 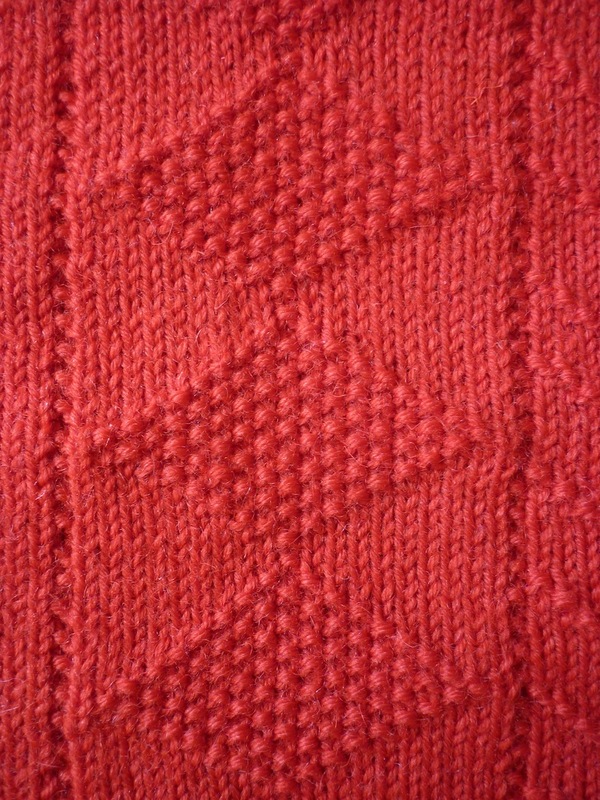 The stick would support the working needle, making for very speedy knitting. You can read more about them on Kate Davies’s blog. I’m in love with the garter stitch arm strap. It also made for easy picking up stitches for the sleeves. The design feels like a coherent entity: the bars and seeds bands are like opening and closing brackets on the sleeves and chest. And the diamond motif is repeated in three different guises. Some things in my knit-frock are not traditional: original knit-frocks were usually black or navy. The body was usually a bit longer and the sleeves shorter. I guess the longer body was to make sure they would stay tucked in. The shorter sleeves would keep them from getting wet and mucky during hard work on a fishing boat. During the course of knitting this jumper I had to perform some delicate sweater surgery AND I found a new way of keeping track of counting rows. All to be revealed in another post! PS can I draw your attention to the blanket I used as a background? 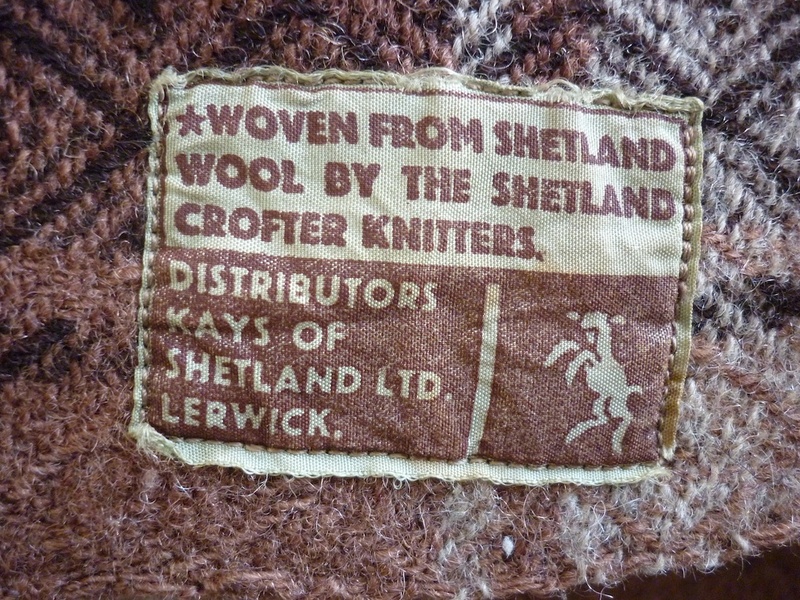 It’s a Shetland blanket, woven by Crofter knitters in, you guessed it, shetland wool. I found it at Snoopers Paradise in Brighton for a mere £20. This is magnificent. Want to see it ON! 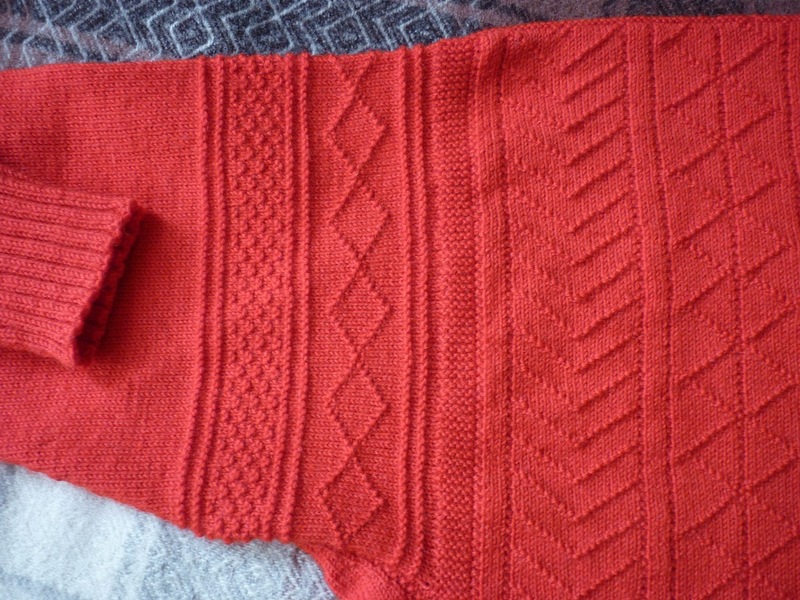 I love what you have written here about the garter stitch bands on the arms, and I think it looks very fine. I also love seeing your version right under the picture in the book… very META! Bravo on a magnificent piece of heirloom knitting.